Habits are big business. In fact, creating, chaning and keeping habits has created an entire multi-billion dollar industry for books, apps, coaching, training and countless products. And why not, habitual behavior makes up about 90% of how we go through the day whether we are conscious of it or not. Our habits dictate how much we get done, how we feel, and how we come off to others. 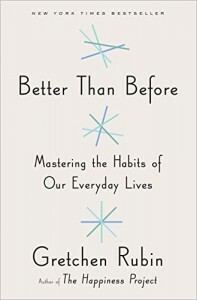 So, doesn’t it make logical sense that good habits serve us and bad habits drain us? Well as many of you surely know it’s not that simple. I mean, well-educated, thinking individuals often know what they “should” do, but still reach for the closest processed junk food they can find. So what’s the answer to forming and keeping the habits that are right for each of us? One of the things I like most about Rubin’s approach is she starts off by acknowledging that there is no one routine that will work for all. First you have to decide what kind of habit person you are. For example, getting up at 5:30 am is a habit that serves me well. I’m a morning person and I get a ton done before many people have had their first coffee. But, there are those that don’t get the creative juices flowing until around midnight – do you think telling them to get up at 5:30 am is going to work? Rubin’s book is a great addition for those people who realize life is basically a work in progress! 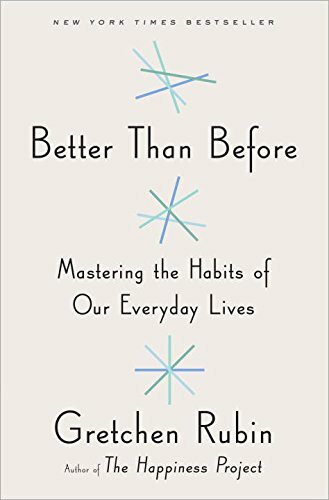 Back in 2012 I interviewed Charles Duhrigg – author of The Power of Habit, you might like to give it a listen as well. What is it like to be an expert on the topic of happiness? What did you learn about yourself while writing this book? How do you keep a routine while traveling? How to be happier by adjusting your daily routines. How to form your positive habits based on your personality. How legal terms can help you keep to your diet. I work with lots of entrepreneurs. In an effort to help them figure out the things they are passionate about, the things that give them purpose and excite them, I often find they resort to listing the things that don’t excite them – the things they dislike about what they do. This usually starts out as a list of people, situations, themes and such and ultimately comes down to types and categories of work. It’s funny, while few can really pinpoint with any real clarity what they ultimately want from their business and their life, the list of things that they don’t want is long and easy to recall. The same holds true when I try to get them to narrow their focus or describe the characteristics of their ideal client. They often come at this exercise by defining the characteristics of the clients they don’t want. Again, true when I try to get them to define the handful of actions they should take each day that allow them to perform at the highest level or fulfill their purpose. The problem with living in this point of view is that it limits your outlook to “freedom of impediment” or freedom “not to do” when true freedom through your business comes from the freedom “to do” that which you choose as the vehicle for a life fulfilled. Freedom not to do, often referred to as negative freedom by social and political theorists, comes about from external forces while the freedom to do, sometimes referred to as positive freedom comes mainly from internal forces or your ultimate desire to express who you are. So, true fulfillment and happiness through growing a business comes by embracing only the things that matter most to you rather than simply limiting the things you don’t really have the ability to control – most don’t make the leap to this place. I’m not suggesting that adopting this mindset is easy, but it might be the true declaration of difference between being a fulfilled entrepreneur and being stuck in a nice business. Until you find what it is in your business that you must do every single day in order to be at peace, you’ll always be fending of that which you don’t want in your life and it will consume you. I’m also not suggesting that the negative forces in your business are something you can ignore or fail to acknowledge, but I am suggesting wholeheartedly that you must find that thing in your business that for you is your magic and move towards practicing only that for the rest of your life. It’s not my intent to frame this in a political light, but owning a business is the ultimate quest for life, liberty and the pursuit of happiness.